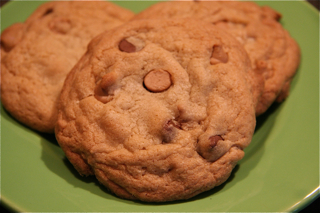 This recipe is the original Nestlé Toll House chocolate chip cookie recipe with peanut butter and chocolate chips. They were excellent! Combine flour, baking soda and salt in small bowl. Beat butter, sugar, brown sugar and vanilla extract in a large mixing bowl until creamy. Add eggs one at a time, beating well after each addition. Gradually beat in flour mixture. Stir morsels and nuts. Drop by rounded tablespoons onto ungreased baking sheets. Bake 9-11 minutes or until golden brown. Cool on baking sheets for 2 minutes; remove to wire racks to cool completely. Grease 15×10″ jelly-roll pan. Prepare dough as above. Spread into prepared pan. Bake for 20-25 minutes or until golden brown. Cool in pan on wire rack. Nestle’s comes through again, don’t they! These look so good I can almost smell them baking just looking at your wonderful picture!